Figure 1. A description of the K2 mission. The pressure of sunlight will help balance the spacecraft as it looks at different regions of the sky that lie on the ecliptic plane. It will look at a particular region for about 83 days until the spacecraft must be rotated to a new region to prevent sunlight from entering the telescope. The Kepler Mission was undoubtably one of the most prolific scientific endeavors in modern astrophysics. Despite it’s untimely end, this mission has discovered well over half of the known exoplanets to date, found the first Earth-like planets in the habitable zones of their stars, and boosted exoplanet studies to a pinnacle of interest for scientists and the public alike. As has been discussed in previous Astrobite posts, a year and a half ago second of Kepler’s four reaction wheels failed, rendering it incapable of continuing its primary mission as three working reaction wheels were required to maintain the high precision and stability needed to detect these distant worlds. However, an endeavor to tweak the mission so it could continue with two broken wheels culminated in the K2 project, which has also been summarized in a previous Astrobite post. Now Kepler is en route to reanimation, saving it from spending the rest of its days as a half-a-billion dollar piece of space junk. 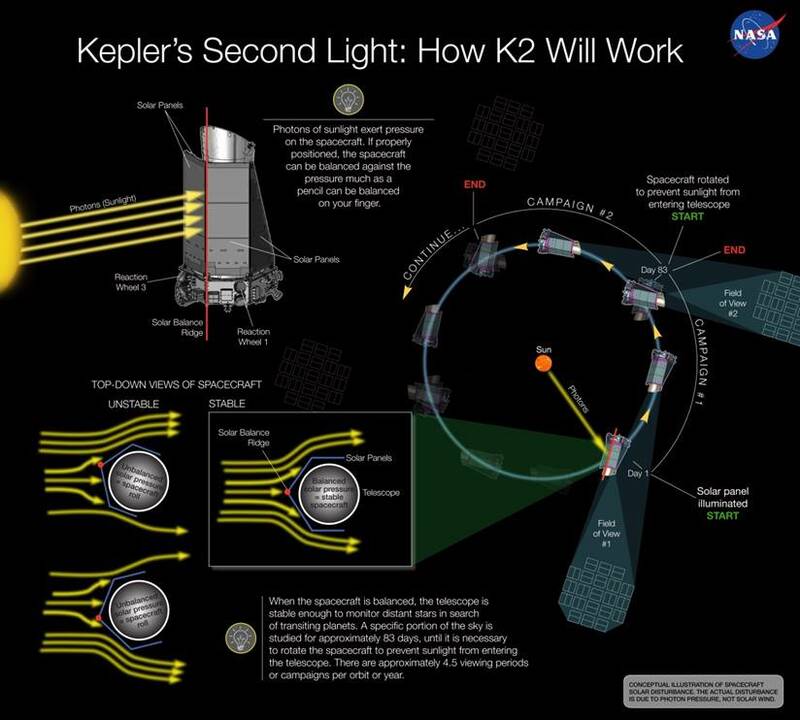 In a nutshell, Kepler will use the pressure of sunlight as a helping hand – a third reaction wheel of sorts. It’s viewing will be confined to the ecliptic plane, and it will be looking at different patches of the sky every 80 days or so (figure 1). This means it will no longer be able to uncover habitable planets around Sun-Like stars (since their orbital periods are far longer than the time Kepler will spend looking for them), but could potentially find similar worlds around cooler M-type stars where the habitable zone is closer in and planets occupying this zone take less time to orbit their star. Today’s paper presents an exciting discovery and a taste of what’s to come when the K2 mission starts – the first exoplanet discovered by Kepler since the failure of its second reaction wheel in August 2013. In February 2014, the Kepler spacecraft spent 9 days observing stars during the Two-Wheeled Concept Engineering Test. Though this test was aimed at trying out the stunts of the K2 mission and not discovering new exoplanets, when the data from this short testing period was made public scientists began to develop methods of analyzing the data from this altered mission. One new data analysis issue that arises with the K2 mission is telescope drift. As the Kepler makes its observations of different patches of the sky, it will slowly drift as the Sun’s radiation pressure pushes against it, and every so often must be set back into position using the spacecraft’s thrusters. This continual correction is visible in the data; as the telescope drifts the concentration of starlight on the camera’s pixels slightly decreases. After the data release, a photometric reduction technique was presented to account for this motion of the spacecraft. This improved the precision of the K2 data by a few factors, making it comparable to the original Kepler mission. Figure 2. The raw Kepler data of HIP 116454 (blue) and the corrected data (yellow). The raw data is offset to provide a better comparison. The repeating dips in brightness in the raw data are caused by the drifting of the telescope from solar radiation pressure. With the data made public and the aid of a new data analysis technique, the authors of today’s paper visually inspected the corrected light curves and uncovered a single transit event for the star HIP 116454 (figure 2). Now, what can a single transit tell us about a planet? The size? The orbital period? The temperature? Not without some more information – without a second transit we cannot determine the exact orbital period, and therefore cannot determine the orbital distance, and therefore cannot tell the size or equilibrium temperature of the planet. However, the authors were able to set a lower limit on the orbital period of ~5 days, since they would have observed more transits if the orbital period was less that the observation time during the engineering test. Also, the authors derived an upper limit on the period using the archive of Kepler data and knowledge of the transit duration. In addition to looking at when planets pass in front of their stars, looking at how long it takes a planet to cross a star can unveil a great deal of information, and has been used to look for unobserved planets in Kepler systems and moons around Kepler planets. By comparing the transit duration length to other planets in the Kepler catalogue, the authors saw that nearly all of the Kepler planets orbiting similar stars with similar transit durations have orbital periods of less than 20 days, and inferred that HIP 116454’s companion was likely analogous. Figure 3. The K2 light curve overlaying the transit time window that was extrapolated from the radial velocity data (blue shaded region). The dotted line marks when the telescope had to make a major adjustment after 2.5 days of observing, and the study only considered data after this adjustment. The green shaded region marks half a period away from the transit (ie. when the planet would be behind the star), and the lack of a secondary eclipse provides credence for the planetary interpretation of the transit and radial velocity measurements. Generally, it takes 3 observed transits for a Kepler planet candidate to be “confirmed” (detected with a high enough degree of statistical confidence). So with the observation of one transit alone, the authors were not able to confirm the existence of HIP 116454’s planet. To gain confidence in their measurement and affirm that the transit was caused by a planet and not some other celestial object, the authors obtained radial velocity measurements of HIP 116454 using the HARPS-North spectrograph of the Telescopio Nazionale Galileo in the Canary Islands. 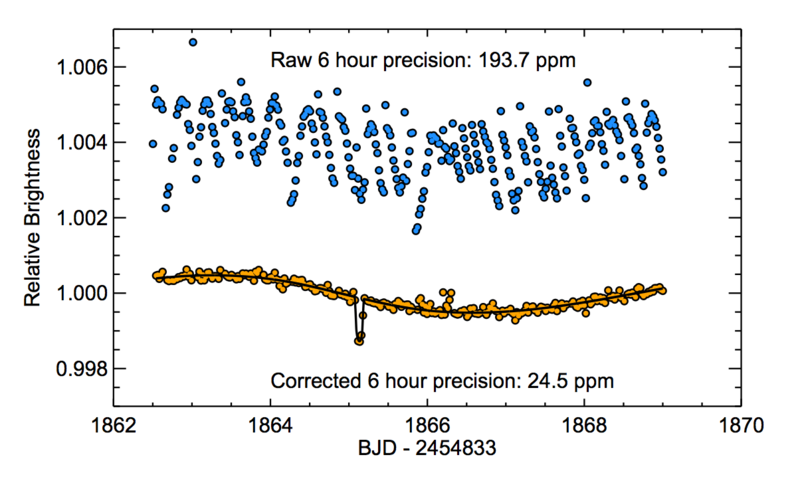 The radial velocity measurements added credence to the existence of a planet in the right range of orbital periods by detecting a radial velocity curve with a 9.1-day period, and also uncovered tenuous evidence of another planet orbiting HIP 116454 with a 45-day period. Also, by extrapolating backwards in time the authors were able to correlate the transit event observed by Kepler with the radial velocity measurement to confirm the existence of HIP 116454’s planetary companion, dubbed HIP 116454 b (figure 3). This planet was found to be a hot super-earth, with a radius ~2.5 times that of the Earth. With both radial velocity measurements (good for measuring planet mass) and transit measurements (good for measuring planet size), the authors were able to determine the density to help infer the composition of the planet. HIP 116454 b’s density is consistent with that of a low-density solid planet or a planet with a dense core and extended, gaseous envelope. 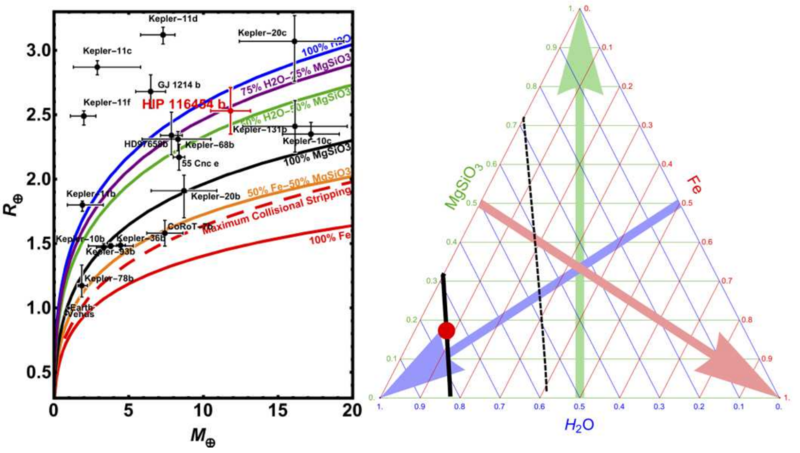 Assuming the former of these cases, this study was able to infer the structure and composition of this super-earth if it is indeed entirely solid (figure 4). Figure 4. Left: A Mass/Radius diagram for sub-Neptune exoplanets. The colored lines infer the composition of these planets if they are indeed entirely solid and do not have a large, gaseous envelope. HIP 116454 b is marked in red. Right: a ternary diagram showing the allowed compositions for solid exoplanets. The thick black line is the allowed composition with the best-fitting mass and radius measurements, and the dashed black line indicates the composition allowed with one-sigma uncertainty. The arrows point towards higher concentrations of water (blue), iron (red), and enstatite (green), and the colored lines intersect at allowed combinations of these compounds. Though this planet is just one of many hot super-earths that Kepler has discovered, its discovery has huge implications in the immediate future of exoplanet studies. K2 will thrive off of planets orbiting nearby bright stars, as they provide an excellent opportunity for follow-up radial velocity observations by ground-based telescopes. Scientific ingenuity has allowed a crippled satellite to continue its exploration of the universe, and we can rest assured that many more discoveries will follow when the real K2 mission begins this year. Though Kepler has been down, it is far from out.